Here is a selection of my small abstract paintings I call "Tiny Treasures"
because they are wonderful little gems e.g. as a unique gift for yourself or someone you love. This piece was sold to a lovely young lady and stays in Germany. Beautiful little gem to put on a shelf, a cupboard, a desk or to hang it on the wall - perfect as a unique gift for yourself or someone you love - reminding e.g. beautiful holidays in Tuscany. It can be hung at the wall or arranged with a tiny easel on a shelf, a table/desk or wherever you like. A tiny wooden easel (white) is included in price. 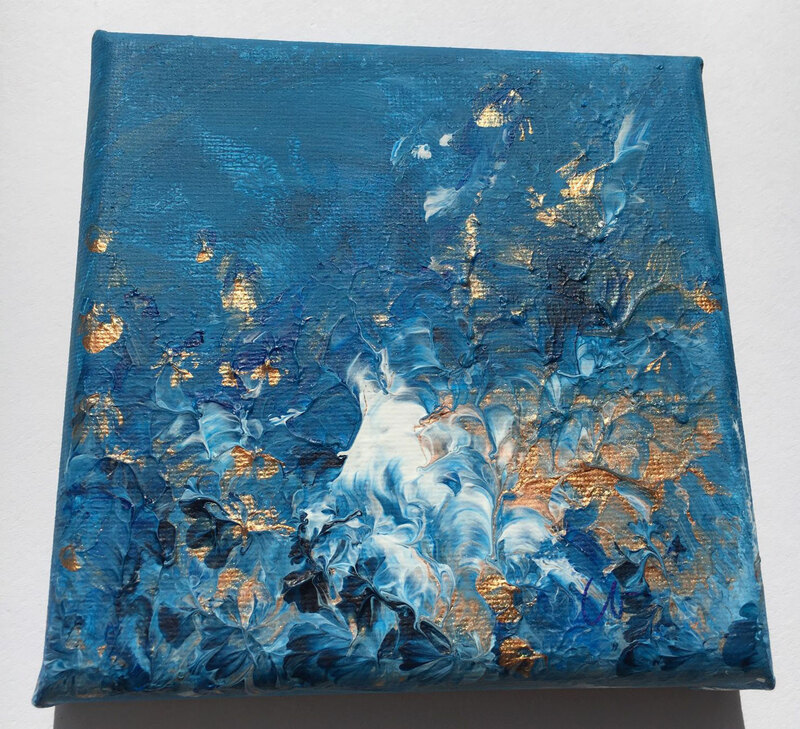 Beautiful little abstract painting with blue and golden acrylic paint to put on a shelf, a cupboard, a desk or to hang it on the wall - perfect as a unique gift for yourself or someone you love. Unique little abstract gem with hints of sparkling copper as beautiful eye-candy on a shelf, a cupboard, a desk or to hang it on the wall - perfect as a unique gift for yourself or someone you love. Beautiful little abstract flower to arrange on a shelf, a cupboard, a desk or to hang it on the wall - perfect as a unique gift for yourself or someone you love. 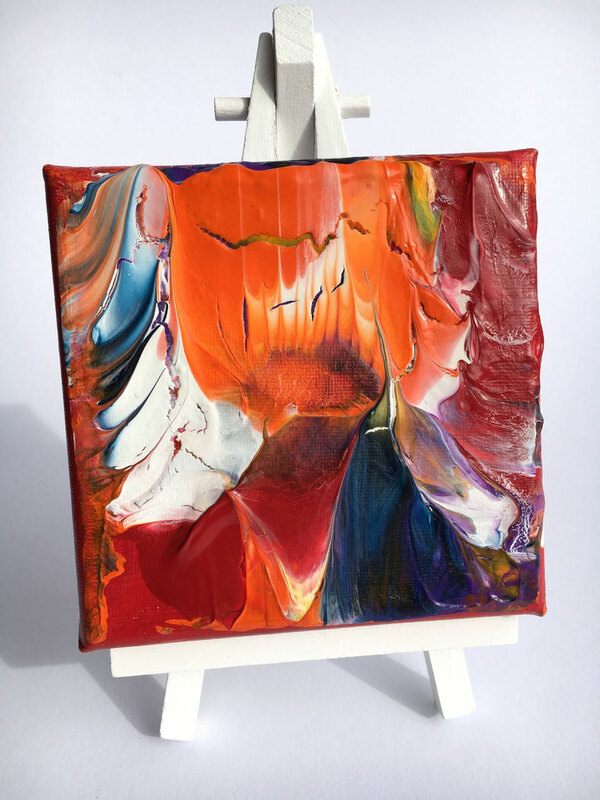 Beautiful little but powerful painting to display on a shelf, a cupboard, a desk or to hang on the wall - perfect as a unique gift for yourself or someone you love. 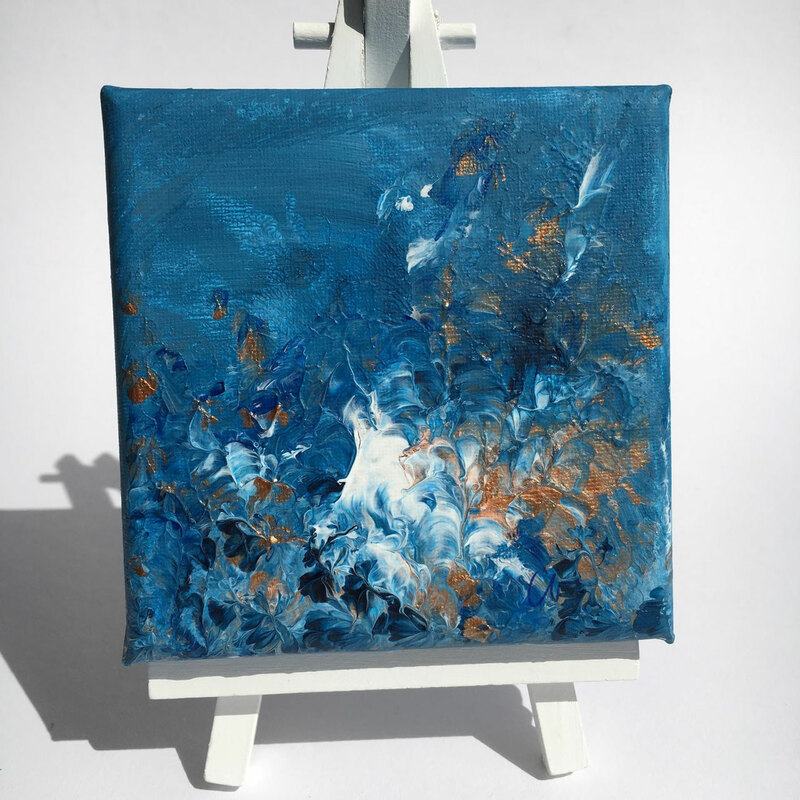 Powerful little painting for blue lovers and loves of the Sea - to arrange on a shelf, a cupboard, a desk or to hang on the wall - perfect as a unique gift for yourself or someone you love. This tiny treasure is sold and went to a collector in Russia. Special little abstract flower with lot s of great texture - to display on a shelf, a cupboard, a desk or to hang on the wall - perfect as a unique gift for yourself or someone you love. Beautiful abstract gem to arrange on a shelf, a cupboard, a desk or to hang on the wall - perfect as a unique gift for yourself or someone you love. The painting comes including a tiny white wooden easel. Abstract flowers never fade or get boring ... this beautiful and elegant piece can be displayed on a desk, a cupboard, a table or can be hung on the wall - perfect as a unique and longlasting gift for yourself or someone you love. A tiny easel (wood - white) is included in price. Unique abstract flower and exciting texture. You can hang this painting directly on the wall (unframed). Special additional offer for an exclusive display: you can buy this tiny treasure also ready framed in a high quality deep edged floating frame to hang on the wall. Eighter way a perfect and exclusive gift for yourself or someone you love. 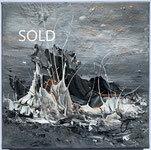 You can buy only the painting - or the painting framed in high quality deep edged frame. 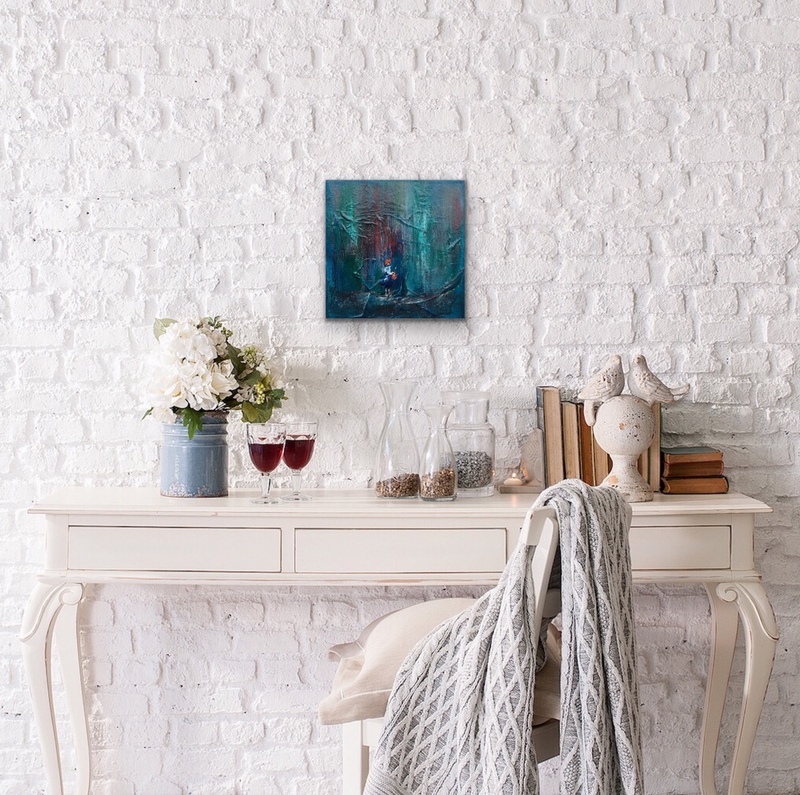 Exclusive abstract painting with a special crackling copper texture. Truely a gem to show on a shelf, a cupboard, a desk or to hang on the wall - perfect as a unique gift for yourself or someone you love. A tiny easel (wood - black) is included in price. Extraordinary thick texture give this little artwork a sculptural feeling. A unique piece to show on a shelf, a cupboard, a desk or to hang on the wall - perfect as a unique gift for yourself or someone you love. A tiny easel (wood-white) is included in price. This abstract tiny artwork with its special copper texture and crackling black is a feast to the eyes. For sure a long lasting pleasure which can be shown on a shelf, a cupboard, a desk or to hang it on the wall. This piece is part of a private collection and is not available for sale. A tiny wooden easel (black) is included in price. This unique little abstract flower with hints of golden paint - is beautiful to see on a shelf, a cupboard, a desk or to hang it on the wall - perfect as a unique gift for yourself or someone you love. For Sea-lovers an exciting tiny gem to remind holidays. It can be displayed on a desk, a shelf, a cupboard or hung on the wall - perfect as a unique gift for yourself or someone you love. Beautiful abstract artwork with exciting texture - to arrange on a shelf, a cupboard, a desk or to hang on the wall - perfect as a unique gift for yourself or someone you love. Abstract flowers never fade ... this beautiful and joyful piece can be displayed on a desk, a cupboard, a table or can be hung on the wall - perfect as a unique and longlasting gift for yourself or someone you love. Beautiful abstract and timeless gem to display on a shelf, a cupboard, a desk or to hang it on the wall - perfect as a unique gift for yourself or someone you love. Abstract flowers never fade ... this extraordinary piece can be displayed on a desk, a cupboard, a table or can be hung on the wall - perfect as a unique and longlasting gift for yourself or someone you love. 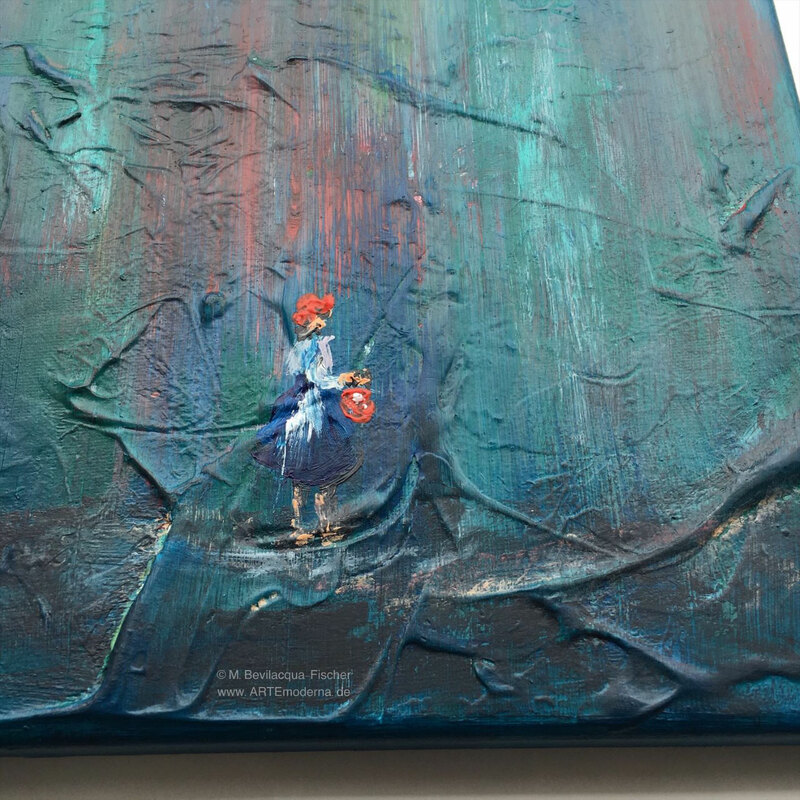 This beautiful and extraordinary piece can be displayed on a desk, a cupboard, a table or can be hung on the wall - perfect as a unique and longlasting gift for yourself or someone you love. Shiny and unique abstract gem to show on a shelf, a cupboard, a desk or to hang on the wall - perfect as a unique gift for yourself or someone you love. 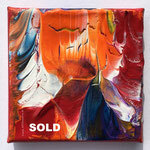 Acrylic paint on canvas, sealed with glossy resin.